Hands Free Glass Bead Cleaning. Part 1. Craft store pipe cleaner, cutters that can cut them (don’t use your good jewelry ones…the inside of a pipe cleaner is not as soft as silver or copper) The lighter is optional, you can use your torch. Burn the fuzzies off of the pipe cleaner. I don’t know if real pipe cleaners work for this, that is, the ones that are sold to actually clean pipes. The craft ones are probably cheaper anyway. You want to expose the twisted wire underneath. It’s not pretty, but it works. Why not just any wire? Because you want the texture of the twist to rub in your bead hole! Put your beads on and make sure there is room for them to move back and forth on the twisted wire. 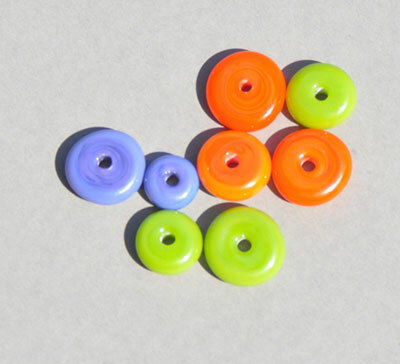 These are 3/32″ and 5/64″ holed beads. I haven’t tried 1/16″ holes yet and wonder if they’ll move enough to work with this. Who knows? Maybe they’ll work better. Make sure to curl the ends enough so that your beads don’t come off. Fill up a tumbler barrel with mixed steel shot (I don’t think it matters if it’s mixed). You just want to give some weight to what is tumbling against your beads and the ends of the wire. You will want it to be about 75% full once you get everything in there. Throw in your wired up beads. You can do many at one time. I tumbled for 30 minutes and they were actually ok. I put them back on for another 30 minutes and even better. I will probably try going longer to really have them clean. But even after the hour they were fine! You can see some of the film of release in there. I was too impatient to go longer…I wanted to show you. I used 1/2 Foster Fire and 1/2 Fusion bead release. The smoother your release I the better this may work. NOTE: I just wanted to pass on a note that was sent to me. If you use your tumbler to tumble silver I was told that your silver could get ‘gunky’ if you use the same barrel because of the bead release forming a type of grit. Please see Tonya Davidson’s comment below this post for instructions on how to clean your tumbler barrel and steel shot. Also, if you’re new to using steel shot, make sure that you either store it fully covered by water or dry it thoroughly when you’re not using it…otherwise, steel rusts. This entry was posted in tutorials on September 1, 2009 by lorigreenberg. I knew if someone was gonna do it, it would be you. 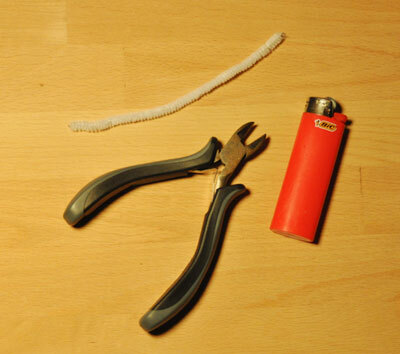 My pipe cleaners are the real thing, from a tobacco shop and they have small little wires all the way around the body in addition to the fluffy stuff. I just burned an end and the small wires are not as “wiry” but still there. But now I’m wondering if it would work without burning the fuzz off. Hhhmmm. I’ll let ya know. As long as the beads can slide along the pipe cleaner it could work. Usually the fuzzy stuff keeps them in place. I was worried about the gunk on the silver and on the shot… I would think you would need to clean the shot too… which would be really time consuming or have extra shot…which can get pricey. Hmmm, I have both the fuzzy and the METALLIC crafty pipe cleaners and I’m thinking of switching to a heavy-duty bead release so I don’t ruin so many mandrels with boro. Maybe the metallic ones would work well with that. It’s a thought! Just a couple tidbits….you can tumble the glass for hours. It will not etch your pieces. I’ve tumbled very delicate angel beads with wings, other seemingly breakable additions, dichro cabs and more for hours (4+) and never had any problems. I’ve also never encountered etching. I use mixed stainless steel shot with Super Sunsheen Burnishing Compound. We sell all these ingredients and the tumblers if anyone needs an affordable source. Second, you can clean your shot with 1/2 cup of water and 1/2 cup of white vinegar. Tumble the shot for 1 hour or less and it will clean the barrel and shot. Rinse as many times as needed. You can get a cheap strainer from the dollar store and that works well. Congrats on finding a more ergonomic way to clean the beads. I think that’s fantastic. Well done…well done! Thanks Tonya! I will make a note in the post to see your instructions below. It’s nice to know of a one-stop-shop where we can get what we need. I love Whole Lotta Whimsy! 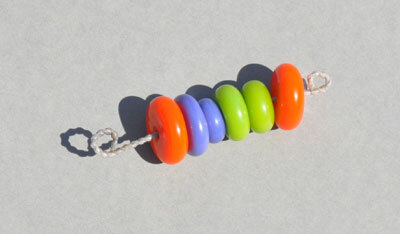 I’d like to use a tumbler to etch my beads, and I’m now wondering if doing this will also clean the bead release away. Thinking it may not be necessary to string them on the wire if etching? I used to HATE cleaning beads with my pointy bead reamer, but since I started using silcone carbide and a mandrel the job is much more pleasant. Except when there are lots of tiny beads to do! Tumbling without the wire doesn’t work to clean the holes. 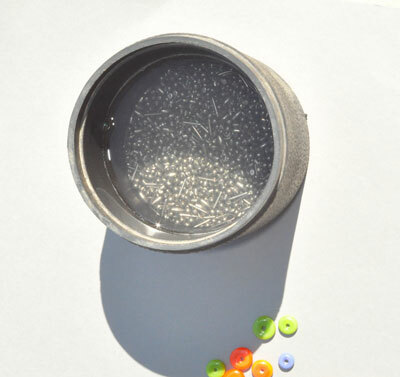 The way the tumbling works is that the shot and other beads press against the ends of the wire and force it to rub against the inside of the bead hole. Using just a grit, it does not have enough weight to wear away the bead release inside the small hole. The way tumbling to etch works is that the grit is ground against the surface between the other beads. Oh my – this sounds like the answer to my dreams. I have a tumbler from years ago when I was stone polishing as a kid. I can’t wait to get some shot and get it up and running – thus saving me valuable time lost to the flame sitting with a diamond file under water ! Thnaks Lori for such a great tip – keep them coming. Thank You! I hate to think of the number of times I have stabbed myself with my pointy diamond file while cleaning beads. There’s enough blood dripped around from all the glass cuts without adding that as well! OMG! I love you, I hate cleaning beads and have a spare tumbler. I’m going to try this! What a neat idea and so much less time consuming! It’s my understanding that stainless steel shot doesn’t rust. I’ve been using the same stainless steel shot for years and it’s never rusted. Even if you didn’t tumble pipe cleaners and glass beads, your shot will get gunky anyway. Usually you’ll notice it when you tumble silver and it comes out a horrible and eerie grey color. The first time this happened to me, I could swear that my heart stopped for a bit. It’s a horrible sight! This is when I dump the shot into a strainer with a tight mesh and rinse the bejeebers out of it. I wash the tumbler too in warm, soapy water. The the shot goes back into the tumbler and is covered with fresh water, just until the water covers the shot. I add burnishing liquid or a few drips of Dawn dishwashing detergent. Pop those horrible-looking silver pieces back in and tumble for thirty minutes to an hour. Your silver will be nice and shiny and your shot won’t give you any trouble for a long while, depending of course on how often you use your tumbler and what you tumble. There is a cheaper, non-stainless steel shot, but it’s a real chore to keep it from rusting. I’d rather pay a few extra dollars for stainless steel. Besides, barring Acts of God or your dog developing a taste for shot, your shot should last forever. Wouldn’t bigger hole beads just need a few burnt off pipe cleaners mixed together? You can twist wire as well using a dremel and use that. I’d use copper or brass for it. It ‘s a wonderful idea and I’m going to try it tomorrow with the few beads I need to clean. THANKS! Yep. that would probably work. So, how did it go? Wow, I can’t believe what a chicken heart I’ve been all this time! I finally gave it a go. I kept putting it off cuz I almost always have something raised on my beads. And I almost did it with just the plain spacers. Then that wild hair rose up and I tossed ’em all in there, even the larger focals, everything except a ring. They are all beautifully clean and shiny. I did pop the dark aqua under the water with a quick dremel. Thanks so much! Woohoo! Happy camper! Oh, and since I cleaned my shot before tumbling the beads all they needed was a good rinse. I just finished a batch of 50 or so 10mm round spacers with 1/16″ holes, which I absolutely didn’t want to clean by hand. I put 25 spacers on each of two wires (I did appreciate the tip that the chenille stems have harder wires than the twisted wire we’d normally have around the studio), with about 1.5″ of extra space on each wire. 15 minutes in the tumbler and they’re clean! This worked like a champ! Thanks, Lori! If you have a flex shaft you can make your own twisted wire. 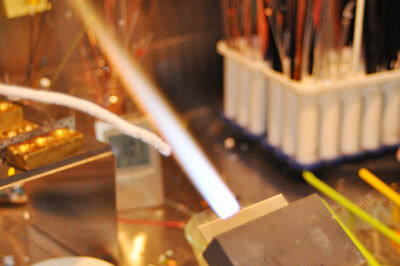 Use a length of thin wire, double it and fasten the loose ends in the flex shaft. Hold the folded end with needle nose or locking pliers and give it a spin. You can do longer lengths and then cut them into shorter lengths.